Video clip of Joan Halifax Roshi, Buddhist Priest, asking Malka Drucker why the title White Fire. 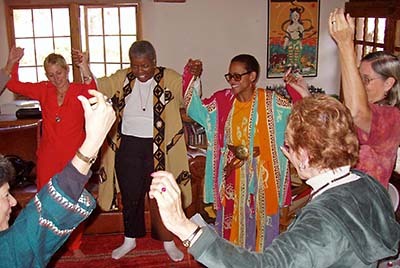 SANTA FE, NM, 9 September 2003, White Fire Ingathering of American Women Spiritual Leaders. Santa Fe Rabbi Malka Drucker convenes the first White Fire Ingathering of American Women Spiritual Leaders, October 13-16 at Upaya Zen Center in Santa Fe, NM. What happens when you put a female rabbi, Sufi master, African-American preacher, and Buddhist priest in a room together for three days? You get white fire, the fire women spiritual leaders make as they change the face of patriarchal and hierarchical religion. This October a group of 12 women will meet in Santa Fe for the first ever “White Fire” retreat. The Ingathering takes its name from an ancient mystical text that describes sacred writings as black fire written upon white fire. Overlooked and invisible, the white spaces surrounding black letters also carry sacred narrative; women are like white fire, bearing the voice of the divine feminine. Dan Brown’s best-selling “DaVinci Code” and the children’s book, “Big Mama Makes the World” testify to the current acknowledgment that mainstream religions have only given us half the face of God. Hosted by Rabbi Malka Drucker, author of “White Fire: A Portrait of Women Spiritual Leaders in America” (SkyLight Paths Publishing; January, 2003), This Ingathering will allow women to share the wisdom and strengths of their respective faith paths and will model the inclusive, cooperative, and imminent style that marks women’s spiritual leadership. In a world grown mistrustful of different religions and religion as a path to peace, the Ingathering hopes to demonstrate that the bond of gender and calling can serve as a bridge between differences. The participants represent a wide variety of beliefs and backgrounds. Some serve religions where gender is irrelevant and others serve where gender determines a sacred role. What these women share is a deep passion to serve and a hope that they can create a new community that has never existed before. In addition to Rabbi Drucker, participants include: Joan Halifax Roshi, Bibiji Inderjit Kaur, Sylvia Boorstein, Reverend Helen Cohen, Reverend Sandy Gess, Dr. Nahid Angha, Rabbi Judith Hauptman, Acharya Krishnapriya Hutner, Reverend Dr. Cheryl Kirk-Duggan, Maryanne Lacy and Luisah Teish. The ingathering will result in a list of White Fire Intentions that will be published on the White Fire Web Site. Plans include the creation of local White Fire groups of women spiritual leaders and fellow travelers; products with a logo that stands for the mission of supporting those who speak in the voice of the divine feminine, and a continuing of the conversation of what white fire might mean in a world darkened by the wildfires of war and indifference.